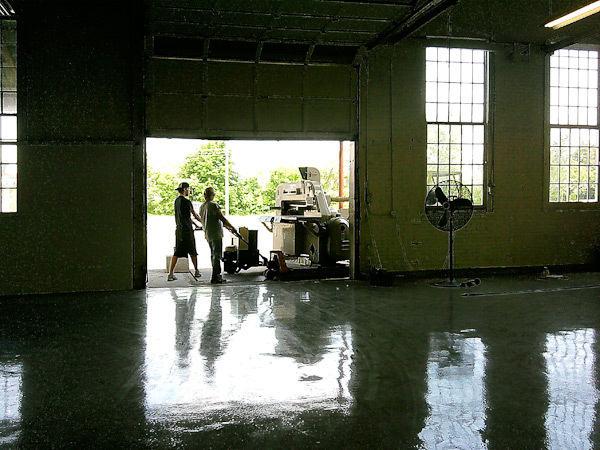 When we made an epic shop move a few years ago from one side of the building to the other, this was one of the most astounding sights ever : a gigantic cutter gliding across a sea of freshly epoxied floor. It was beautiful to see this great machine docked at its current post! This entry was posted in Ephemera and tagged Boxcar Press, green print shops, letterpress print shop, New York, print shop, syracuse by Carrie Valenzuela. Bookmark the permalink.